Showcase your creativity with envelope scrapbooks. If you have lots of memorabilia you want to save, learning how to make a scrapbook from envelopes is a smart idea. These creative albums are a great way to preserve photos and small mementos from the important occasions in your life. Envelope scrapbooks offer a fun twist on the traditional scrapbooking album. These special books are full of pockets that provide an interactive element to the project. Envelope scrapbooks also make great gift albums for someone who doesn't scrapbook. Even the most "non-crafty" person will have no trouble slipping their mementos into the pockets of an envelope album you've created. Essentially, an envelope scrapbook is a collection of envelopes bound together with photos, journaling, and embellishments added in the appropriate spaces. The envelopes then serve as pockets for memorabilia relating to the theme of the album. Lick your envelopes and close them. Carefully cut open the right-hand side of each envelope to create memorabilia pockets. If you'd prefer a more distressed look, you could try tearing each envelope open and inking the edges for a distressed appearance. Cut a cardstock cover for your album that is the same size as your envelopes. 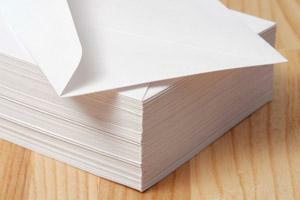 Use your hole punch to punch binding holes along the side of the envelopes and the cardstock cover. Tie the envelopes and the cardstock cover together with ribbon. Add photos, embellishments, and journaling as desired. Keep in mind that heavy dimensional embellishments often don't work well for envelope scrapbooks, since the envelopes don't offer much support for bulky pages. Card Inspired showcases an adorable Christmas album made by binding greeting card sized envelopes together. Sarah's Ink Spot has instructions for making a small album with five envelopes. If you don't have enough memorabilia to justify making an entire envelope scrapbook, try simply adding an envelope to your regular scrapbook layout to create a small pocket for your favorite mementos. This is an easy way to incorporate the envelope trend into your scrapbooking without devoting too much time or energy to the project.Adding origami envelopes to your scrapbook pages is another fun technique to try. Envelopes made from your favorite patterned papers are both pretty and practical as accents for your layout. If you're a paper-folding novice, LoveToKnow Origami has an easy to follow origami envelope tutorial.